The artists in the exhibition, Nothing In Isolation, all have roots in Latin America. But rather than focus on a singular identity, artists are paired to celebrate the importance of dialog. The dialogues are sometimes aesthetic, sometimes cultural, sometimes conceptual, but, above all, use art to model the urgent need today for conversation. This pair, as the only artists showing paintings in the exhibition, makes a connection through medium. 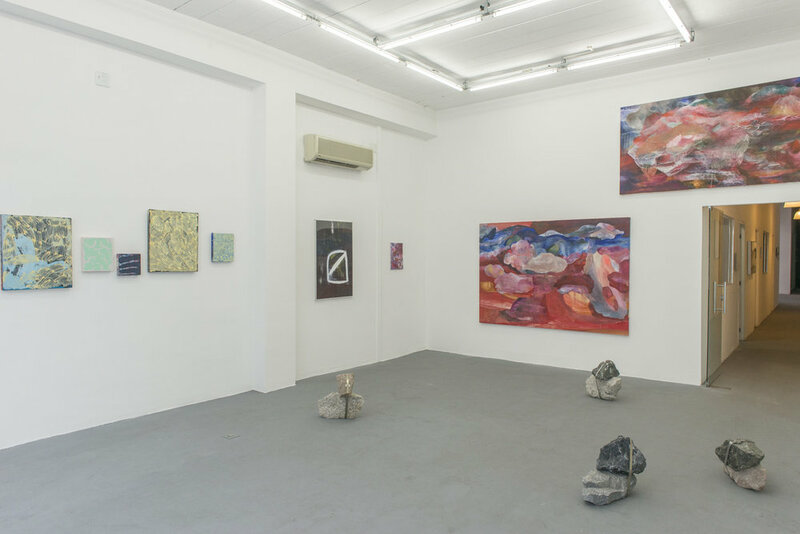 But both their work in general share an open ended reading – they flirt with the absurd while creating friction between the figurative and abstract. Lynch describes it as: “a fascination with innocence and the ludic, a mix of fear, feminity and memory”. It is a fantastic reality. 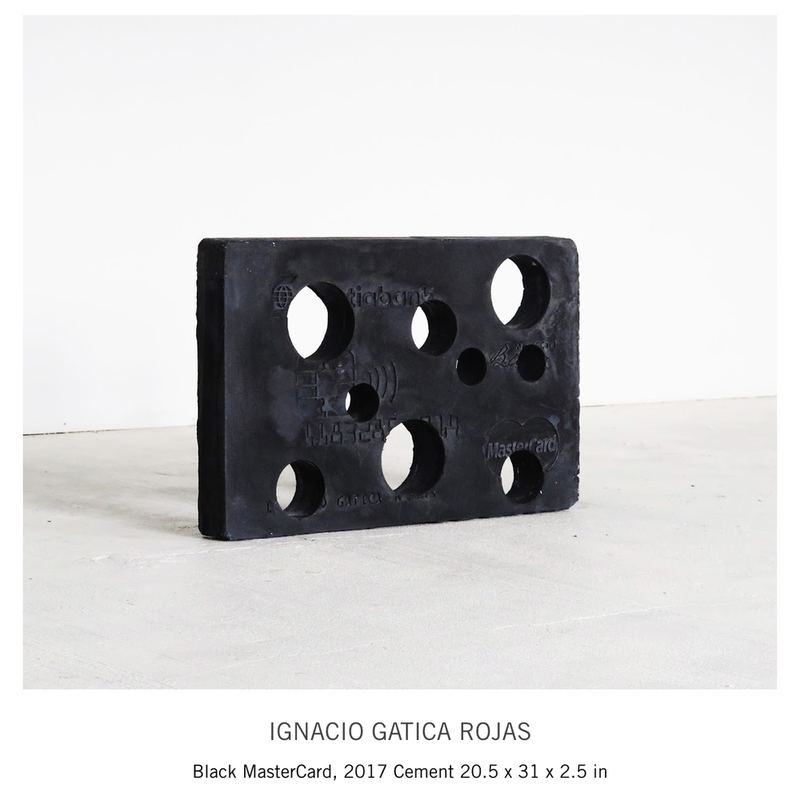 The installations of Pintado and La Roche both work on the principle that multiple parts gain force when presented together as one – the whole greater than the sum. For Pintado, the array of geometric shapes in Particles reference Newton’s treatise first describing light as particles rather than waves. La Roche’s collection of rubber erasers, one of his collections of quotidian objects he began in 2013, project their own cosmology when shown as a group. Paper, collages, cutouts and overlapping shapes define the works of Quaresma and Ember presented here. Further, both artists pursue their final work through experimentation. They expand the importance of process. 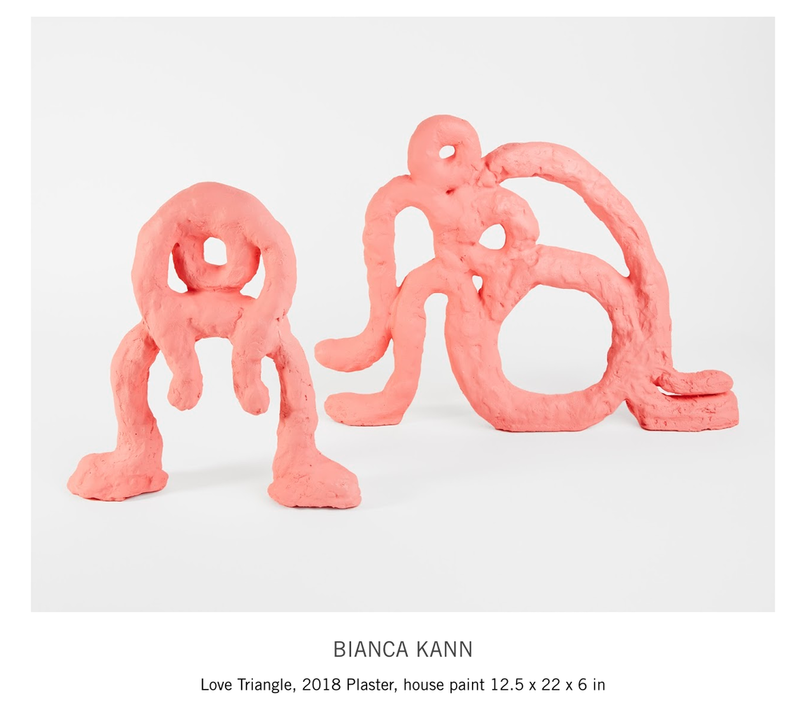 This pairing revolves around the medium – they both work in ceramic – and the social – they share a studio and both have twin sisters. As well, the freedom of their expression together with very current pop references brings a fresh and powerful quality to their work. The making of an artwork by removal of material, creating negative spaces, appears in the works of both Kater and Gatica. In Kater’s photos the edges of the cutouts gives us a hint of what was there. As for Gatica, he is interested in the fragmentation of language, and undermining what consumes our present condition. Both artists engage the viewer in a dialog as well, demanding our imagination complete the images. Both Costalima and Pelaez create readymade sculptures that target the inherent tensions in the laws that govern us, both laws of nature and laws of society. Costalima's sculptures test the laws of physics while she creates an unlikely pas de deux between two rocks. Without a metal clamp, the parts would collapse as they relent to the the laws of physics. For Pelaez, his sculptures merge seemingly unrelated objects and distort their intended function. For this exhibition, stolen car mirrors become security surveillance cameras that capture our reflections. Gisela Gueiros has a Masters in Art History from the Sotheby’s Institute of Art in New York, and has organized more than 20 exhibitions of emerging artists in New York City and São Paulo. 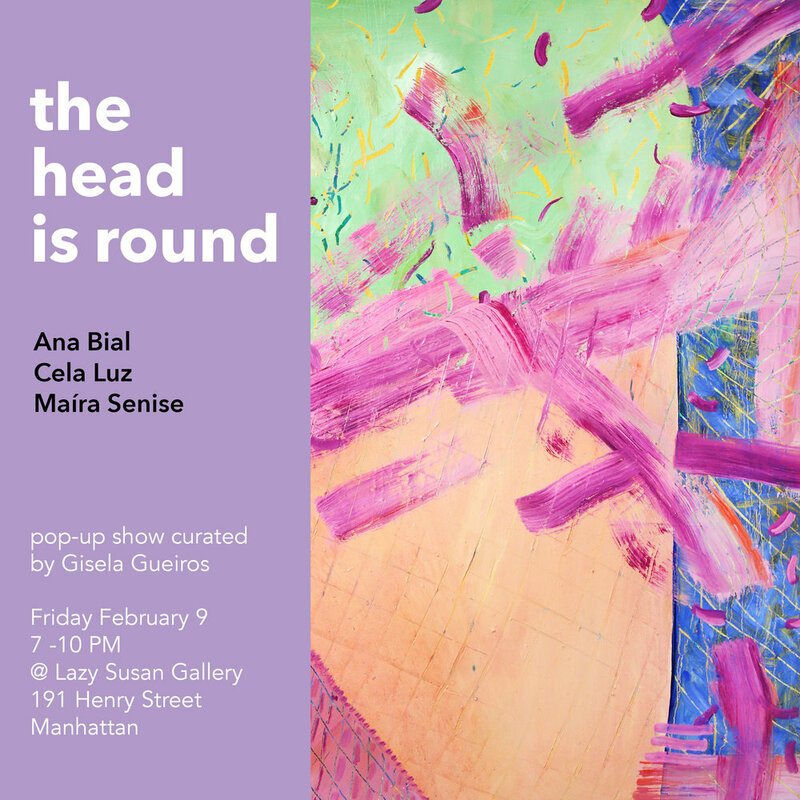 The French artist and poet Francis Picabia wrote, “Our heads are round so that thoughts can change direction.” Inspired by the quote, this exhibition brings together paintings by artists, Ana Bial (1987), Cela Luz (1986) and Maíra Senise (1989). 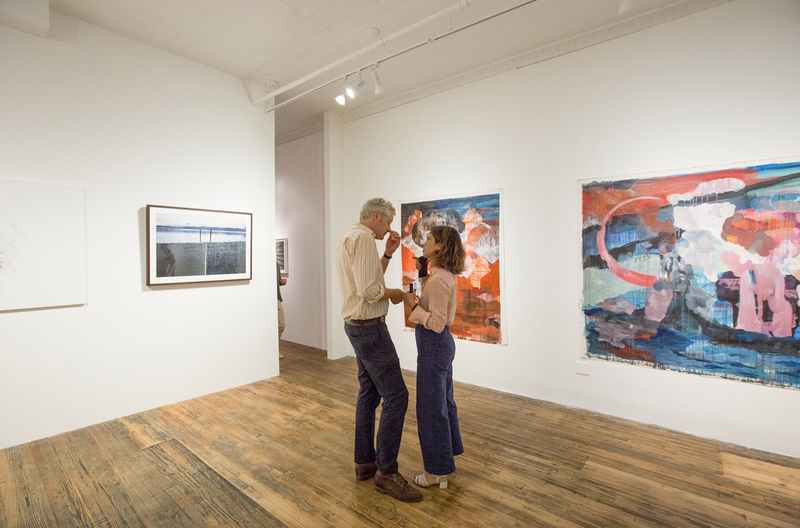 In the months leading up to the show, the artists and I were in constant communication, exchanging ideas. Like a white canvas or an empty stage, the possibilities were endless. The artists helped shape the show itself, as much as they made the work. It was a true collaboration. Bial creates visual collages of everyday commonplace images, presented as still lifes on canvas. The supermarket pamphlet, with its anonymous design in vibrant colors, a dry rose, left over from a job as a product stylist, each finds space and new meaning in Bial’s paintings. They are images which would otherwise be discarded. Among the quotidian, representations of her own sculptures and paintings also appear. Her work is like an archaeology of her own present. Luz’s paintings serve as stage for a dance between figurative and abstract. With a palette of strong colors — yellows, pinks, royal blue, light green, oranges and reds — the images feel insistent, and more captured by her lively canvas than placed or drawn. Even complete, the paintings feel free and loaded with potential. Raw and rough, Senise’s paintings have the ingenuity of children’s drawings. Rudimentary imagery — such as the house, the sun, animals and misshapen figures — becomes poignant in the artist’s attempt to regain a lost purity. Senise seems to treat the oil-based paint as a pencil and canvas as paper, demystifying the entire history of painting. The result generates a strange sweetness. 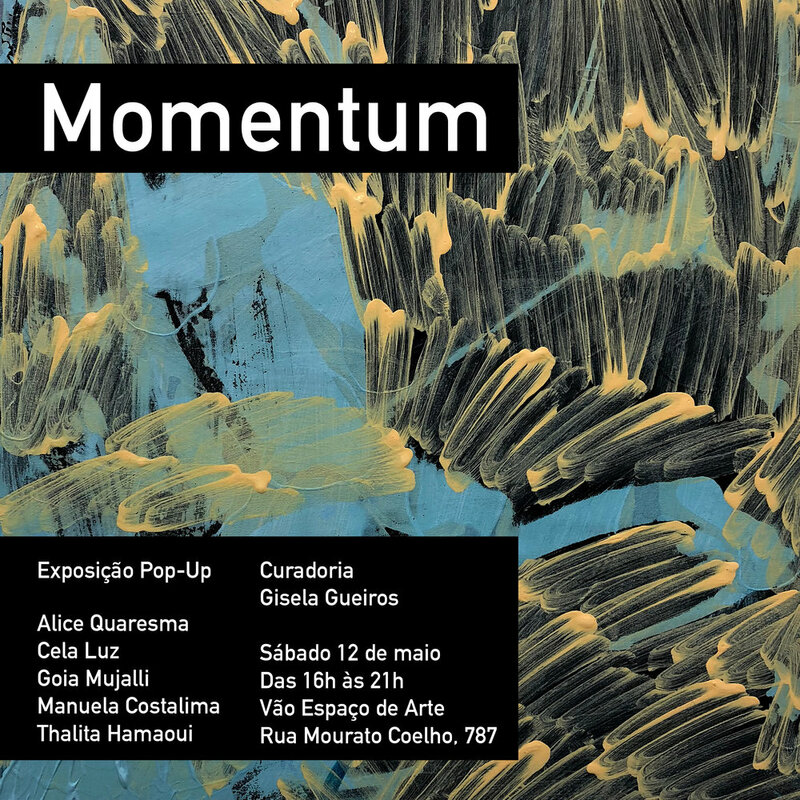 Brazilian artists Alice Quaresma and Julia Brandão’s lively compositions are at first simple and spontaneous, their beauty subtle, their geometry not perfect, as if they were innocently looking for some space in the saturated flow of images of contemporary life. But like blocks or bricks, each shape in their work seems like an essential element in the building of a solid structure. Every bit of paper or fabric brings power and life to the dynamic of improvisation. There is a feeling of adventure or openess – a new plane where there is more room for fantasy, flexibility. The space between the shapes become an activated stage, ripe with possibility and charged with anticipation – the beauty of the puzzle. After a few attempts, the disposable may become useful again. Carrying on the tradition begun a century ago by Matisse’s cut-outs, Picasso and Braque’s collage, and Calder’s mobiles, Quaresma and Brandão present us with a fresh new version of these explorations. Fitting handmade shapes into space, they test the limits of the medium as they get freed from the flatness of the picture. Helio Oiticica comes to mind as well, as someone who’s fabric “Parangolés” – wearable sculptures – stimulated tactile perception and invited participation. 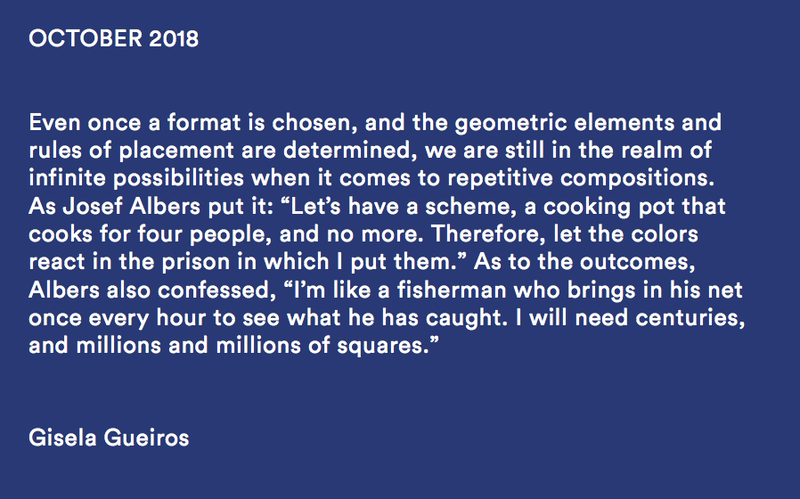 He too let geometric shapes free, with an added tropical twist, launching perfect squares reminiscent of Malevich and Mondrian into the space through dance. Here, with Puzzle, the artists offer us similar motivation to keep moving, to keep trying, to keep believing in the power of finding a solution. us more disconnected from immediate reality. Constantly looking at screens – smartphones, laptops, TVs, our avatar gets more exposure than our “real life” persona. And as we congregate in cities, we are especially disconnected from nature, and more in need of a fix. These artists are each consumed with this crisis. André Feliciano creates sculptures that delight by collapsing the image and its making. Imagine the hordes of snapshots taken as cherry blossoms bloom. There could easily be one camera per flower on a sunny spring day at the Botanical Garden. Feliciano, as an art-gardener, has simply fused the two - literally readymade photographic blooms. A humurous but pointed reminder of how we now see so much of life through our cameras/phones. Talita Zaragoza shows us two different ways in which she mediates nature. In some works, she interferes in the landscape before photographing it, marking her presence in front of and behind the camera. In others, she makes her marks on the photograph itself, layering the mediation of nature. Further, her subject is sometimes a landscape that has been previously transformed by man. Each layer in her work brings awareness to the long-lasting influence of our presence on the natural world. 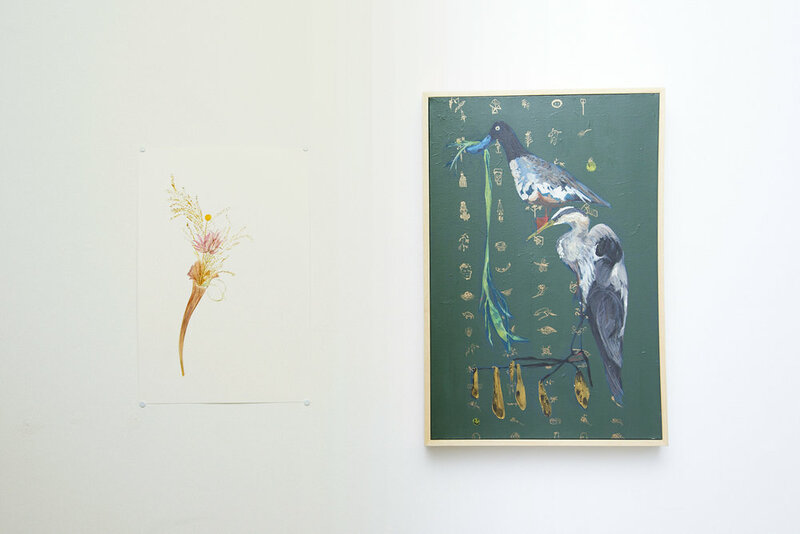 In another act of layering, Andrea Rocco’s paintings are sourced from her great grandfather’s collection of Natural History books. 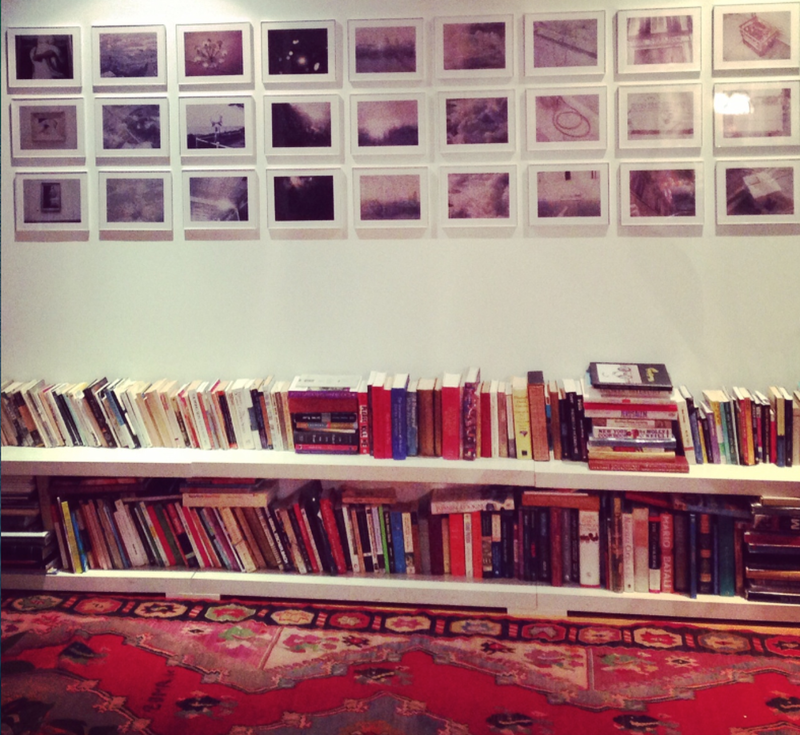 For this work, she is especially interested in images from fables and Mughal paintings, from South Asia. Seeing representations of nature that , in fact, come from a book feels like a strangely contemporary exercise. Ricardo Alves had every opportunity to work directly from nature. While walking on the campus of São Paulo University, he saw plenty of banana trees. He had even sketched a banana tree and hung it in his studio. But he found he wasn’t interested in the plasticity of the real thing. It was only when he found a representation of the tree in a botanic illustration book that he found a way forward to make the painting. Sandra Javera reveres the idea of nature always unfolding – every day spent outside is an invitation to discovery. By focusing on roots, her work serves as a reminder of their invisible but grounding importance. It is a strong root that allows a branch to reach out further. Liana Nigri works in the subtle liminal space between natural and artificial, real and re-creation. The bacterial colony, originally used as biofilm to “clone” recognizable organic forms – leaves in Nigri’s case –, became the raw material with which the artist develops embryonic studies. Lab research allows her to create a second skin, an artificial epidermis that carries memories of another life. As the exhibition reunites these different views of nature, a stroll in the gallery gives the visitors the chance of pretending they are just out for a walk in a garden. Stopping for a closer look in this garden, however, shows we never stop learning from nature – or from art. this ‘procession’. Their works relate to or incorporate concepts explored in the book – such as strolling, repetition, nature, presence, and the urban landscape. In Sandra Javera and Alfonso Simelio’s mobile Stepped Gravity, 2016, we get a sense of the effortlessness of walking and its repetitive, fluid and monotonous movement. As dull as it can be, it is never tiresome. It may become a visual mantra in the same way that walking can be done for nothing: just to connect us to the pace of time passing. Gustavo Prado presents us with Untitled, Contortionist series, 2016, reinterpretations of Lygia Clark’s participatory Bichos. They remind us of the traces a path leaves behind or a trail to follow. “To get there you must walk: walking in itself, as it takes time, establishes presence”, states Gros. They represent both endless possibility and the cycle of repetition. Talita Zaragoza takes long walks herself in order to reach the places she photographs. The photo So Long, 2016 was taken this summer in Alaska and seems like the perfect conclusion of a hike. As Gros beautifully puts it, “Once you no longer expect anything from the world on these aimless and peaceful. walks, that is when the world delivers itself to you, gives it self, yields itself up.” Her drawing (Sfumatto, 2016) evokes topographical maps and the romantic dream of exploration. To walk in nature, the writer reminds us, is to be perpetually distracted. Trees, flowers and the colors of the roads greet you and demand attention. Sandra Bacchi pays homage to two different trees in Untitled 7 and 8, Anatomy Series, 2016 which almost look like Courbet’s L’Origine du Monde as they open up generously and powerfully to the sky. “You are facing a mountain, walking among great trees, and you think: they are just there. They are there, they didn’t expect me, they were always there. They were there long before me and they will still be there long after me”, says Gros.! 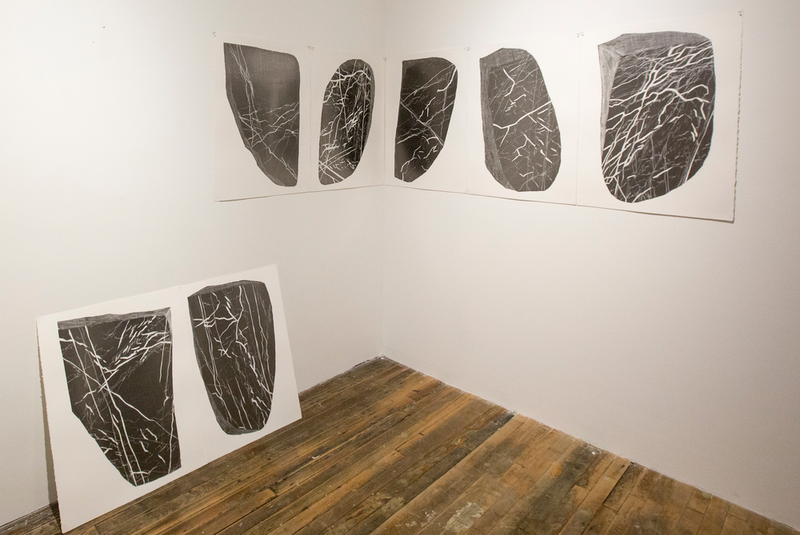 In a similar way, Gabriel Giucci uses graphite to depict a series of subtely differing rocks (Nero Marchina 1, 2, 3, 4 and 5, 2015). An observant walker knows that the shapes in nature, the stones, the bark, the leaves, the scents in the air differ from one another. The pace of each step gives us time for understanding the details that make everything unique. Luiz d’Orey, with Untitled 27, 28 and 29, 2016, represents the flaneur in the context of this exhibition. A sensitive investigator of the urban environment, d’Orey begins by collecting remnants of posters being glued, removed or overpainted on construction fences. He later transforms these recycled bills into a two- dimensional representation of the actual building being contructed behind these walls. The multi-layered process focuses attention on the boundary between public and private, chaos and order. In Gros’ thinking, walking causes absorption. Thalita Hamaoui’s dreamy paintings (These Memories Were Not Mine I and II, 2016) are intense but quiet, reminiscent of the mind that is emptied after a long walk. “You are finally hearing what has no vocation to be retranslated, recorded, reformatted. Before speaking, a man should see”, recommends the author. 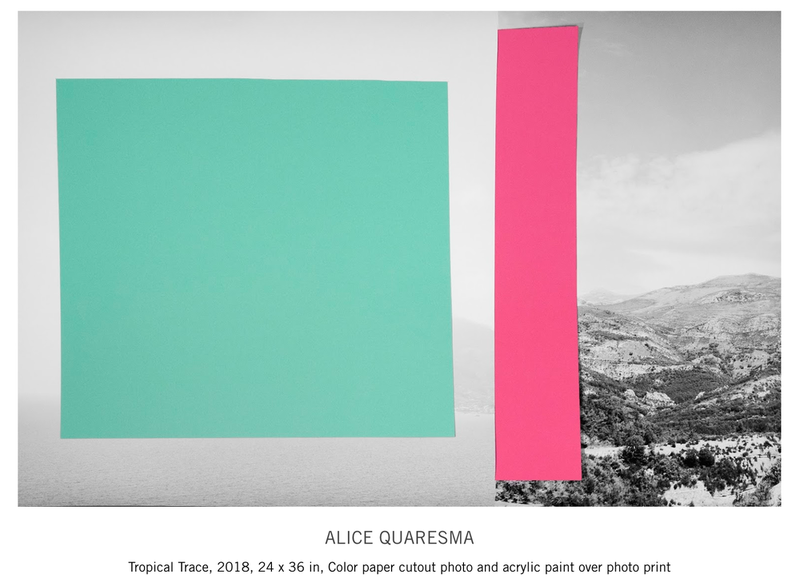 Alice Quaresma noticed that she was letting her works travel independently as she mailed them to residencies, clients, and exhibitions around the world. The shipping boxes where she packed her work (From Inside Out I and II, 2016) are icons of portability and transit. Somehow, the bureaucratic poetry of postal handling mimics our own traveling experiences as we wonder. The idea behind this exhibition is a romantic one. Wife takes over the table with ceramic sculptures, while husband occupies the wall with watercolors. Interestingly enough, in Lisa Schilling’s stoneware we see vases opening up as if they were peeling – multiple layers protecting whatever this vessel will hold. And on Eric LoPresti’s CD-sized variations on New Order’s 1983 album cover Power, Corruption, and Lies, roses seem to be blooming, exhaling their scent and sensuality through paint. Shown together, their works create a beautiful dialogue where we are welcome to imagine what they exchange. But it also becomes clear that whatever is happening here belongs to a much more intimate setting that we will never witness. 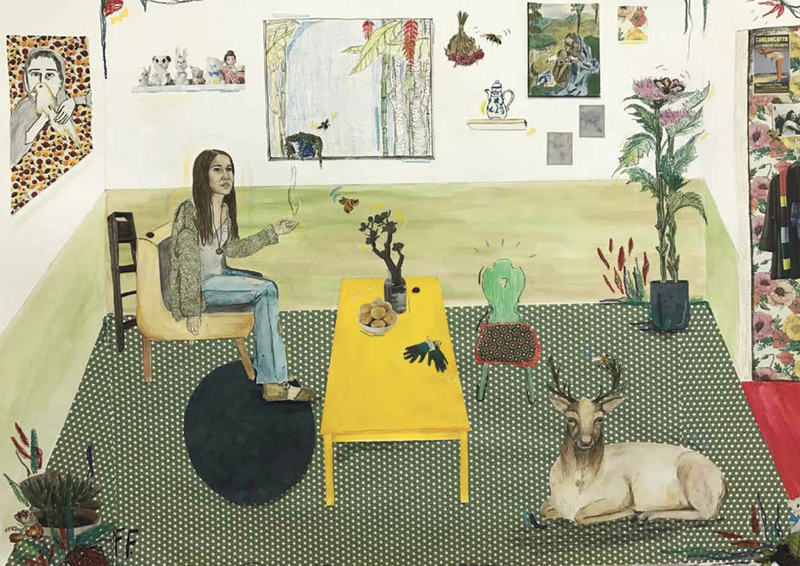 Fernanda Feher’s paintings, drawings and collages are intimate and surreal. Maybe they are surreal because they are intimate – and reach deep into her most fantastical memories. The nomadic life – from São Paulo, to New York, to Lisbon – has given her enough ingredients to fill in the blanks of solitude with creatures great and small: pink monsters, large fishes, bees, snakes or a cat. What brings extra magic to her whimsical compositions is the sense that we are always safe in her imagination. Sometimes we are in nature, where the foliage is sultry and the snakes and other animals are enchanting. 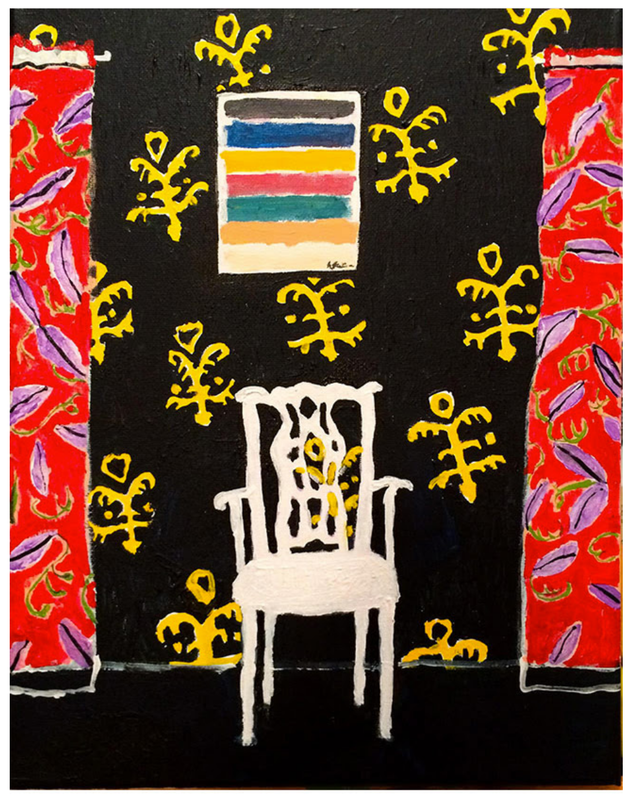 Sometimes we feel at home, protected by the walls of architecture, such as in Matisse’s paintings. It is a peculiar visual sensibility, but inviting not frightening. Her imagery is, in a way, handed down. Feher is the grandaughter of Lily Sverner, a surrealist photographer, born in Belgium, and raised in Brazil after fleeing the Nazis. Reflecting on her grandmother’s recent passing she asked herself “Why do some people stand tall in our memory and some just fade?”. While describing her work, Feher pinpoints the notion that nothing is permanent, nothing belongs to us, and there is no right or wrong way to go. This fearlessness bleeds through her images and touches our hearts. Just watch her be. and works in Lisbon, Portugal. She attented classes at the Arts Students League of New York and graduated with a BFA from Pratt Institute.